It’s July, and the puffins are at Eastern Egg Rock! Every the puffins return to their historic breeding ground on the tiny island off the Maine coast, after being painstakingly re-established there by volunteers from Project Puffin, and later in conjunction with the National Audubon Society. These tiny, and fascinating, sea birds come ashore to nest, but otherwise spend their time at sea in the North Atlantic, ranging from Maine to Newfoundland to Iceland to Ireland and Scotland’s northern islands, and even to France. Several harbors not far from Brewster House Bed & Breakfast in Freeport Maine offer Puffin Cruises. Two are nearer to us than others. 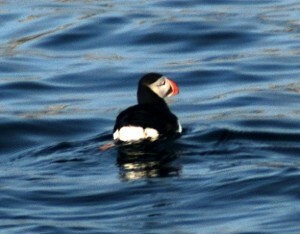 Cap’n Fish‘s Audubon Puffin Tours is in Boothbay Harbor, about 45 minutes from Brewster House. Hardy Boat Cruises, in New Harbor is about an hour away. Since Eastern Egg Rock is a bit north, Hardy Boat provides a somewhat shorter ride to the nesting area. Both cruises have an Audubon representative on board, to help with information about the Puffins, as well as identifying the other sea birds you’ll see on the cruise. We took a cruise with friends and had a wonderful time, seeing many puffins flying, and in the water, as well as on shore. There were also many other birds that are not often spotted on the mainland. It is a cruise well worth taking. We also had a bonus of seeing whales and dolphins, as well. 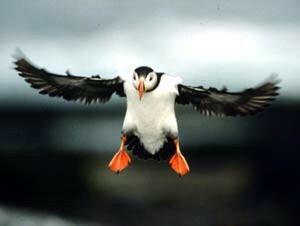 The puffins nest only until about late August, when the chicks are able to float away on the currents, and, if they survive, to fly off to the North Atlantic.